This article was originally written for & published in the Cascade Business News. It’s a new year. If newsstand headlines are any indicator, there’s simply no better time for a makeover than right now. If you’re looking for the lowdown on the latest trends in workplace fashion, stop reading. Otherwise, here are a few suggestions to add professional polish to your small business’s digital identity. A quick scan of your email address book should suffice as proof that many small businesses still rely on free email accounts given out by search providers or ISPs. If you’re the guilty party still sending business email from a Hotmail account, let’s face it: such a practice is not “hot” in 2016. Setting up domain email, e.g. “your_name@yourbusiness.com”, is a simple and affordable way to reinforce your brand identity & project credibility. You need not be technologically gifted to set up your own business email. Given the proliferation of simple-to-use email management tools, the average business owner can set something up in under an hour at minimal cost. Popular options range from tools from search providers like Google’s Apps for Business or Yahoo’s Business Email, to the email management interfaces provided by popular domain registrars like GoDaddy & BlueHost. An hour or so spent registering a domain & setting up company email will enhance the professional appeal of marketing materials, and provide a simple means for creating & controlling employee email accounts. Lastly, for those using a free email address from an ISP, creating domain email will liberate you from relying on said ISP’s good graces should you ever decide to switch providers. 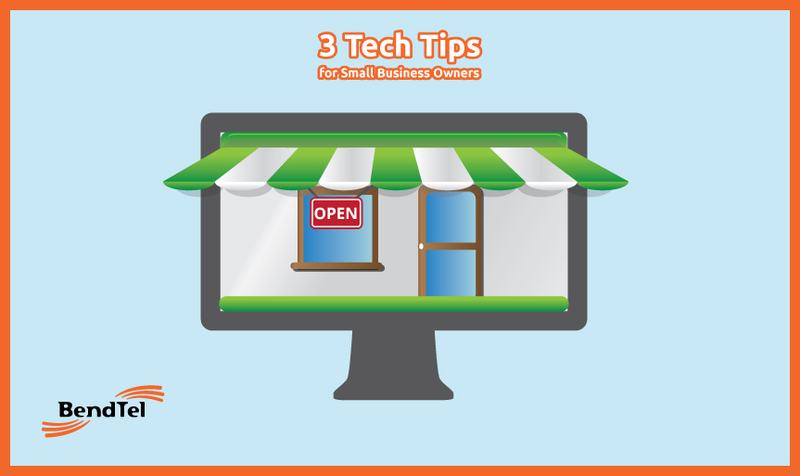 It was widely reported last year that half of small businesses still have no website. If you’re asking why your business needs a website, consider framing the question in reverse: Why doesn’t your business have a website? If your answer is that it’s too expensive, too technical, or too time consuming to have a company website, then it may be time to reassess the technological landscape & update your stance. Bend is blessed with a thriving community of web developers & designers; two free Meetup Groups, the Bend Web Marketers Group, and the Bend Web Design & Development Group, are active local organizations worth checking out if you’re looking to connect with a reputable local designer or programmer. If you’re operating on a shoestring marketing budget, and you have 2-3 spare hours, don’t despair: check out the “website builder” tools provided by the same search engines and domain registrars noted in Tip 1. Such tools are designed to help the average business owner set up a simple, serviceable website with only a minimal investment of time & money. If you’ve recently started a business or changed your business location, take time to do a quick online search for your business name, including your city/state in the search phrase. Looking at the results, take note of whether your business information is shown correctly on third-party directory websites that list your location address, phone number, etc. You can also use the free online tool at Moz.com/local to automate this process of checking for missing or inaccurate data. If you find any issues, then prioritize correcting them. This process is worthwhile, not only to ensure data accuracy, but also to boost the online visibility of your business. In closing, here’s hoping these simple tech-related “makeover tips” will be useful in making 2016 a profitable & exciting year for your small business.